Click here to join an email list and be notified of retreats as they are scheduled. 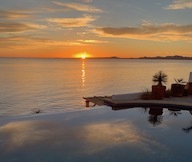 We're headed back to the lovely Casa Tara in El Sargento, Baja California Sur, Mexico! March 13-20 and 20-27, 2020! Email or call 715-231-9000 to get on the retreats list or to get more information. What is a retreat? A time away from our daily life events and duties. A journey to find internal stillness, to gain perspective, to find center. Then from that center we return to our lives with new energy and insight. I often think that, instead of the word retreat, these adventures should be called dive-ins. Sure, we retreat from daily activities and responsibility in order to gain perspective, but frankly, it is the turning of our vision and listening inward that holds the greatest power, that offers deep and long-lasting transformation. I believe in the power of retreats, and enjoy leading them a great deal. I intentionally select retreat environments where nature is in abundance. I find these environments work like brain balms, and invite us to quiet the chatter, to shed our crusty layers of self and unearth potential and potency that is waiting just beneath the skin. I believe in the power of strong community and solitude, good food and music, activity and stillness, and so I seek to bring these elements into my retreats. I have taken groups to Mexico, Costa Rica and Lake Superior's North Shore, and the experience is so truly awesome that I usually begin planning the next one upon our return. The length, focus, and cost of each retreat varies from time to time, but my intention is always to offer an enjoyable and evolutionary experience at an affordable price. I continue to seek out new venues, and look forward to the magic of each group that forms. It is indescribable.